Herman Cain was a candidate for the 2012 Republican presidential nomination, creating a revolutionary tax reform plan known as 9-9-9. After earning a master’s degree in computer science, he began his varied and successful career as a ballistics analyst for the Department of the Navy. Later, he was President and CEO of Godfather’s Pizza, President of the National Restaurant Association, and Chairman of the Federal Reserve Bank of Kansas City. He has two children and four grandchildren and lives with his wife Gloria in Atlanta. 9-9-9 An Army of Davids offers fresh and unique solutions to our current economic crisis. It goes beyond the first steps—un-electing President Obama and repealing his dangerous laws and executive orders—and focuses on fundamental reforms that will make our economy soar as it did in the 80s and 90s. 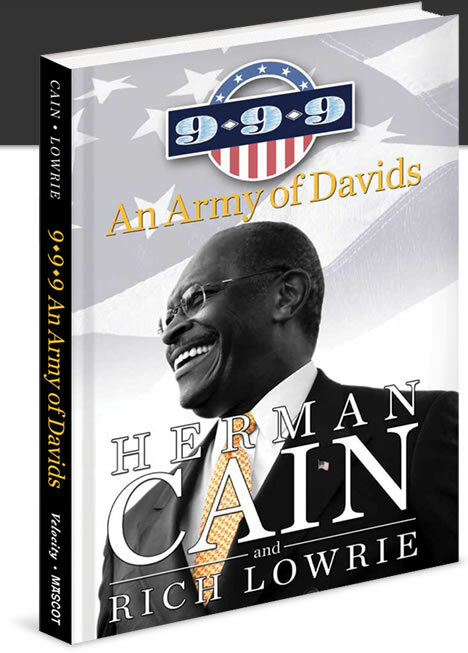 9-9-9 An Army of Davids shows why the country needs Herman Cain’s signature 9-9-9 tax plan and the elimination of a tax code that holds us back robs us of our initiative, discourages jobs, and swamps our economy with imports.